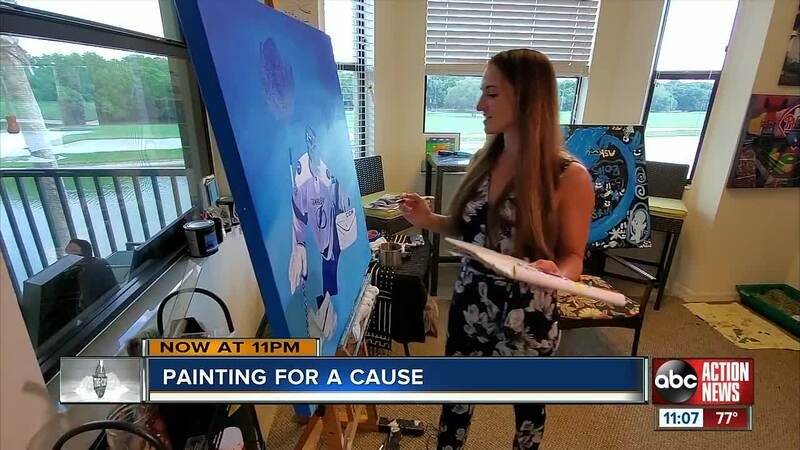 A Tampa Bay artist is combining her passion of painting and sports to benefit local charities. TAMPA, Fla. -- Since she could pick up a paint brush, Cortney Wall has married her two passions of sports and art. She focuses on capturing those iconic moments fans want to relive time and time again. “An athlete who’s influential on the field and off the field making an impact," Wall said. The Bradenton artist paints with a purpose, often completing her portraits live in front of an audience at events raising money for local charities. It's a visual performance she's loved since she was 16. When the puck drops for game three on Sunday, Wall will hit the pallet to finish her first Lightning-inspired portrait of goalie Andrei Vasilevskiy at a special playoff watch party in Valrico. "I had this idea of him catching the puck and then creating this stormy sky in the background with lightning bolts coming right down into his glove," Wall said. Bullfrog Creek Brewing Co. is hosting a fundraiser for Seeds of Hope during Sunday's game. Seeds of Hope is a non-profit that encourages kids to volunteer in Hillsborough County. A win-win from the canvass to community. "I feel like I’m reaching so many more people and having ten times the impact, so for me, that is incredibly gratifying,” Wall said.